In July, I bought the Huawei E585 in Hong Kong. This is a nifty device which allows me to have a mobile WiFi router that is battery operated and can be used with my WiFi enabled devices like my iPad. The purchase was timely because Smart has started to offer a SIM card only unlimited internet plan. This means that I do not have to pay extra for the Mobile broadband Dongle. Prior to this purchase, I already have another Smart Bro line – this is the Smart Bro Share It. The E585 and the Share It devices do the same thing – they allow WiFi devices to connect to them and share internet service through a Mobile Service provider. I was happy with the Share It device ( which incidentally is also made by Huawei ). However – the device is not too portable and you always have to look for a power plug to make it work. So I thought I will now be in internet heaven with the E585 and unlimited Smart Bro SIM only card. Apparently – I was wrong. Instead of paradise – I found myself mostly in Internet Limbo. That place when you see internet websites just clocking and never reaching its destination. At first, I attributed this degradation of service to SMART’s Friday Freedays. These were two Fridays in July and August in which they offered unlimited internet service to anyone. This caused huge dissatisfaction to paying customers like me. However – I noticed – that after these Freedays – Smart didn’t seem to recover. The service speeds had just been unreliable. One brief moment, Speedtest on my iPad will register their promised 2 Mbps. But most of the time – the service is just too slow – reminding me of the speeds we have with dial-up. There are even times when I get zero speeds. I know that this is not a question of signal availability. When I do these tests, I have a strong HSDPA or 3G signal. So this is about a clogged network. I don’t know why Smart’s internet network is clogged all of a sudden. Did they sell too much too soon? Note – that I am actually experiencing this on both the Share It and the E585. So I’m sure that it’s not the device causing it. Or is Smart a victim of a Degradation of Service (DoS) attack? Whatever the reason for these problems, SMART better find a solution soon. Note that I am also an Infinity subscriber and I’m very close to loosing my patience and thinking of switching to Globe not just for my internet service but also for my Mobile Phone service. Smart Bro – needs to be Smart about this – and show brotherly love to their customers and get me to the Internet heaven that I thought I signed up for. I’m still happy with these speeds. They’re decent speeds for Browsing. Unfortunately – this is what I have been seeing mostly. This is Internet Limbo. The Filipino Gay Community is speaking out together. The first topic is about “Coming Out”. I have tons to write about the topic which is why I think this will be a challenging assignment – since it will be difficult to edit and keep the post short and sweet. If you are gay – Filipino – and has a blog, join us. Follow this link for details: Theorgy. I have downloaded the Glee app so many months ago. I was excited to use it during the first few days. 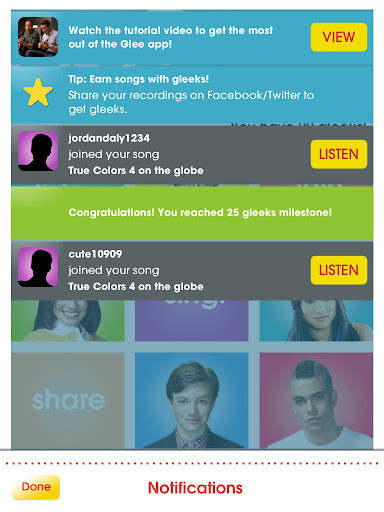 Having an app which allowed me to sing to the tunes from Glee was just awesome. I was able to sing most songs but I realized a lot of them were beyond my vocal capabilities. You see, I sang bass/baritone in the glee club. This means that the songs of Finn are beyond my vocal range. I can sing the girls' songs just an octave lower. I sang hundreds of times but I've only uploaded less than a dozen. These were the renditions that I was not embarassed to post. Luckily,I get nods of approval from the listeners around the globe. Today, after so many weeks of not checking out the app, I discovered that someone joined me in two renditions of "True Colors". Initial reaction? I felt violated but i got over it in two minutes. That's the essence of the app. It's a venue for Glee fans to sing, listen, and sing together. Flying on Philippine Airlines from Cebu to Manila, we discovered that the Coach seats actually have personal screens. That was a pleasant surprise. The flight was less than an hour. If you fly Cebu Pacific – you have the in flight games lead by the Flight Attendants. Not all Flight Attendants from Cebu Pacific are “fun”. So I’ve been to a number of those flights when those games end up as dry attempts to amuse the passengers. With the Personal Screen of PAL – a passenger actually has access to a number of games. One of them is a Trivia game which you play against other passengers who are interested in the game. My competitive streak got the better of me and I took the game really seriously. Another game is a favorite: Bejewelled. I love the game on Facebook. I love the game on my iPod and iPad. Of course – I love playing it on the PAL personal screens. I am concluding my experiment on Grindr. For my regular readers, you already know that I have been trying to figure out what attracts the men who use Grindr. The methodology that I used was not scientific. “Attraction” is measured by the number of messages I get depending on the picture that I used in my profile. For both pictures, I get opening messages from men indicating that they find either the Giraffe or Char Siew cute. They then proceed to ask how I am doing and then go back to talking about the picture and the animals in them. After a number of exchanges – that’s when they focus the conversation on me. They ask more questions about me and make an assumption that I love animals ( which is true ). 1. The animals are neutral topics. Men don’t like being rejected and ignored. They seem to know that if they talk about the animals first – they will get attention. 2. These pictures provide a glimpse about my personality. It starts the conversation. It’s a lot harder to approach a man ( even online ) when you don’t really know anything about them. 3. The picture is not intimidating. Depending on whether a person is better looking or not – they can be intimidated by a very good looking face picture. I do get asked for a clearer face picture after a few exchanges – I’m happy that they continue with the conversation even when they see the face picture. I am finished with my experiment. It was fun to meet new friends while doing it. For now – I will stick with the Giraffe picture.